Resize paper 6 to 22%, paste, apply your mask, delete, merge group, duplicate, flip, mirror, merge down. Resize frame 2 to 30%, free rotate to the left at 15 degrees, change the blend mode to overlay, duplicate, change the blend mode to hard light, merge down. Resize the original frame 2 to 30% and paste on top of the rotated frame. Resize element 7 to 25%, change the blend mode to Luminance (L), move below the frame layer. Resize element 11 to 30%, paste below the house layer, change the blend mode to Luminance (L). Being on the top layer, resize element 16 to 30%, paste on top of the frame layer. Use a light drop shadow on this and sharpen once. Resize your tube to 33%, paste on the right side below the frame, erase the leg parts, duplicate, bring to the top and erase the part covering the wordart memories. Being on the bottom tube, duplicate, mirror, place below the tree layer, change the blend mode to screen, duplicate, merge down. Resize element 15 to 20%, paste on the left side. 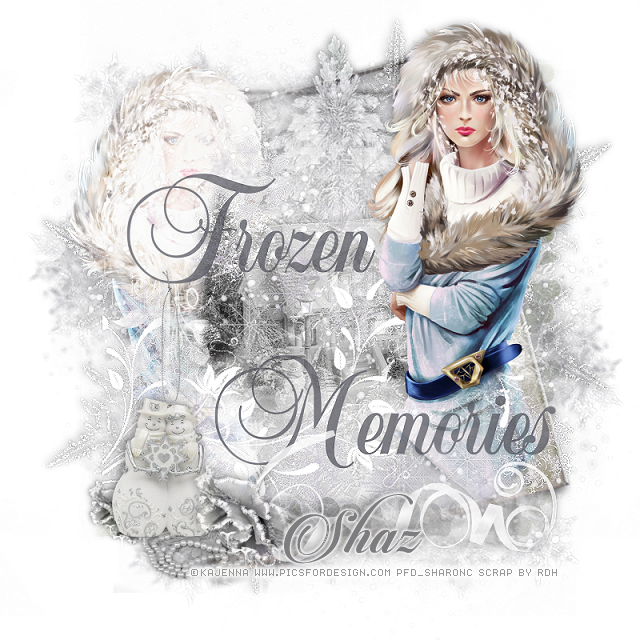 Resize element 1 to 8%, apply Mura Meister Copies-Line* with the 1/n Fade out checked, paste below the snow couple layer, erase the sides you do not want showing. Duplicate, free rotate to the right at 90 degrees, move to the right below the frozen wordart layer. Resize element 4 to 10%, place above the snow couple layer to the right side of them, change the blend mode to Luminance (L), duplicate, resize to 65%, place on the left below the snow couple layer. Resize element 9 to 10%, place below the other flowers on the left, go to Adjust, Hue and Saturation, colorize with both numbers on 0. Resize element 22 to 15%, below the flower layers, change the blend mode to screen. Resize element 19 to 55%, paste above the mask layer, move up and over to the right a bit, duplicate, mirror, move down and to the left a bit, merge down, add noise at 100%.